SKU: sjs19. Category: Canvas Print. Well of Reconciliation – Central to the painting is the Well of Reconciliation understood as the spring of hope from which true repentance, forgiveness, restitution, recognition, restoration, empowerment and relational healing have their source. With respect to relationships between Australia’s Indigenous and non-Indigenous people it is also the source of mutual respect and honouring dignity. Elders Mentoring – Surrounding the Well are the large black U prints that cup smaller black U prints. These represent the wisdom of Elders mentoring and raising up the next generation of leaders for all Australians, Indigenous and non-Indigenous alike. Elders and Leaders – The brown silhouettes of two men and two women represent a respect for those Elders who with courage and endurance have weathered great adversity and struggle in seeking to guard and promote the rights and dignity of the Aboriginal and Torres Strait Islander people. Visions of Reconciliation – Inside their hearts is the Wellspring of Reconciliation. These leaders are the custodians of a vision for a better future where all Australians enjoy a unity amidst a mutually valued diversity. They extend their hands to the shoulders of the next generation symbolising a Christ-centred world-view baton transfer. They are passing on the vision and responsibility to guard and model healthy and respectful relationships for all Australians irrespective of their varied cultural backgrounds. 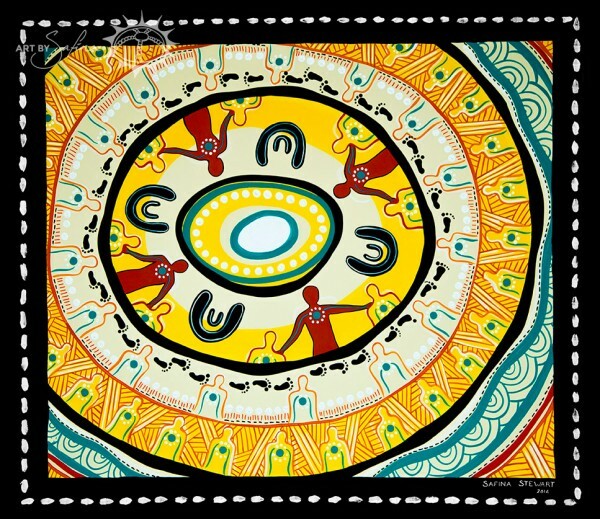 People – The outer rings of people symbolises the positive multiplying effect that the “lived out” message of reconciliation can have on others when they embrace each other and join together to share the message with all Australians. There is an an exponential multiplying effect towards positive holistic change that is wonderfully possible as this happens. Footprints/Long Journey – The footprints represent the long journey of the past, present and future in working together towards the God-honouring goal of humble understanding, unity and respect that knows not ethnic, gender or age boundary. Then we can truly celebrate the words “we are one (i.e. reconciled), but we are many,” from the popular Bruce Woodley anthem, ‘We are Australian’.